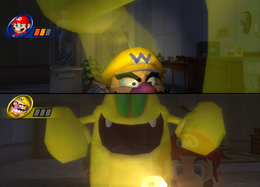 Specter Inspector is a Duel minigame featured in Mario Party 8. A piano is playing alone, and the camera zooms into a picture with various enemies. Then, when lightning strikes, the piano stops playing and the game starts. The minigame takes place in a first-person perspective from the two players. The two players use flashlights to see in the dark. Then, they need to find three of the eleven enemies: Koopa Troopa, Goomba, Amp, Red Boo, Flutter (or Butterfly), Fly Guy, Whomp, Thwomp, Piranha Plant, Lava Bubble and Penguin. These enemies are hidden in objects such as pictures, vases, the piano, and the table. The first to find three foes wins. In some places are hidden ghosts that startle and stun the character for a short time. Amp – An Amp is found under a plate cover, on the table. Flutter (or Butterfly) – A Flutter (or Butterfly) is hidden in the piano. Fly Guy – A Fly Guy is found inside a picture with its face. Goomba – A Goomba is found inside a white vase. Koopa Troopa – A Koopa Troopa is covered with a sheet on a pedestal. Lava Bubble – A Lava Bubble is found in the fireplace. Penguin – A Penguin is found in a yellow vase. Piranha Plant – A Piranha Plant is found on a pedestal, covered with a sheet. Red Boo – A Red Boo is found inside a picture. Thwomp – A Thwomp is found behind the right curtain of the window. Whomp – A Whomp is found behind the left curtain of the window. The lights come on and all the enemies and the two participants are posing for the photo. The winner and the loser make their winning and losing poses respectively. The photo is taken and the camera zooms out to show the picture on the wall with two ghosts laughing next to it. If no one found any enemies within 5 minutes, nothing else happens. Rules – "Find the classic foes hiding in the furniture! Find three first! Ghosts won't count toward your score!" Hint – "You'll know if furniture is hiding something if it rattles when you shine your light on it."